Microsoft Announces E3 2018 Date And Time | Nerd Much? Another E3 2018 date follows Bethesda’s, this time from Microsoft. They will be holding their Xbox E3 2018 Briefing on June 10th, 2018 at 1pm PT. For the first time ever, Microsoft has decided to move their press briefing from the Los Angeles Convention Center to the Microsoft Theater. For those that may not know the area, don’t panic, the Microsoft Theatre is literally across the street from the convention center. The distance is no longer than the average University campus, if not smaller. Microsoft plans on holding all Xbox E3 events at the theater, including the Xbox FanFest. The Xbox FanFest is essentially the showroom floor, where press and consumers alike can take part in a variety of activities, hands-on gameplay, and demos. There will still be a Microsoft booth in the convention center, but it will be dedicated entirely to Mixer. This is a place where folks can come by and play games, stream, and generally interact with games to share on the forum. 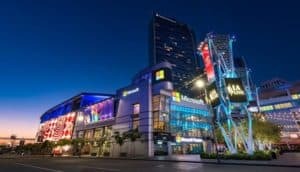 With the extra space that the Microsoft Theater provides, Microsoft states that they are planning on a fresh approach to E3 that will be the “biggest E3 showing ever.” Mighty words when we have not heard of any exclusive AAA titles coming to the Xbox besides Sea of Thieves, Halo, and Crackdown 3. However, it might be that exclusives are no longer Microsoft’s goal and they are open to having all their games on every console. It certainly fits with Phil Spencer’s continued insistence that cross-play between the PS4 and Xbox is something Microsoft is completely open to. But does that mean the company will eventually stop making consoles and leave it up to Sony and Nintendo? Who knows. What would you like to see from Microsoft at this year’s E3? Do you want more exclusives from the company? What do you think Microsoft’s plan is without them? Let us know in the comments below!